In April 2016, the sixth Annual General Assembly of doctoral candidates at Kiel University took place. Those of you who did participate were just as enthusiastic about representing the doctoral interests here at the university as the people who attended last year. Your newly elected doctoral candidates’ representatives for the 2016/17 period will also continue to actively work towards the improvement of the conditions and interrelations for doctoral candidates in Kiel University. This new tenure, you are represented by: Martin Gerth (Faculty of Arts and Humanities), Fan Zhang (Medicine), Agnieszka Karas (Arts and Humanities), Daniel Gonnermann (Mathematics and Natural Sciences), Ehsan Biniyaz (Mathematics and Natural Sciences), Hanna Piepenbring (Arts and Humanities), Jinru He (Mathematics and Natural Sciences), M. Faisal Shahzad (Agricultural and Nutritional Sciences), Markus Lutz (Mathematics and Natural Sciences) and Nico Alexander Gaida (Mathematics and Natural Sciences). We want to take this opportunity to thank the team of 2015/16 for their work and energetic commitment. The new representatives look forward to a fruitful new term. f.l.t.r. 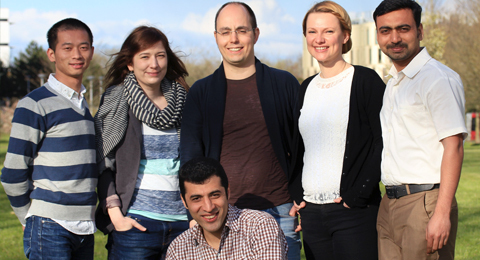 : Jinru, Hanna, Ehsan, Martin, Agnieszka and M. Faisal. Fan, Nico, Markus and Daniel are missing on the picture.